Intel’s answer to the popular $25 Raspberry Pi credit-card sized PC, the Galileo Gen2, is set to be available in August for around $60. Like the Pi, the Galileo Gen2 computer is an uncased board with all the components necessary to build a PC. Only external peripherals need to be attached. Galileo is targeted at the community of do-it-yourselfers and enthusiasts who make robots, small electronics, wearable devices and even PCs. The Gen2 succeeds the first Galileo computer, which started shipping late last year for around $70. The new Galileo has a low-power x86 processor called Quark, while the Raspberry Pi has an ARMv7 processor. 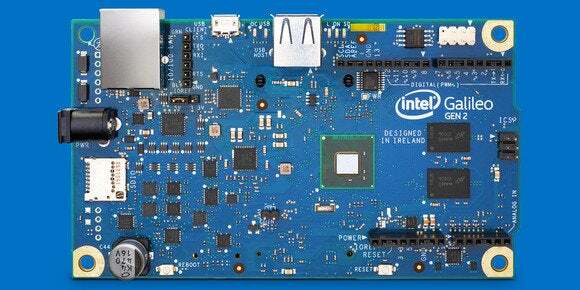 Intel is trying to make its way into the wearables and robotics market, and is using Galileo as a way to explore opportunities for the Quark chip. The chip maker is pinning its hope on the maker community to come up with ideas. At $60, the board is more expensive than ARM-based alternatives like Raspberry Pi and BeagleBone, which starts at $50. But with 100-megabit ethernet and 256MB of DDR3 memory, Galileo offers more features for its price compared to the ARM options. The Galileo Gen2 has incremental upgrades over its predecessor, and the sum of features should allow devices made with it to function better. Robots and 3D printers should move more accurately with the improved PWM (pulse-width modulation) control line, which will deliver more bits of resolution for better movement control. Power over ethernet (PoE) capability has also been added, and general-purpose input/output (GPIOs) speed and toggling capabilities have been improved. The Galileo Gen2 runs on a 32-bit Quark SoC X1000 chip, with clock speeds of up to 400MHz. It has slots for USB, mini-PCI Express and Micro-SD card storage. The board runs Linux, and supports the Arduino integrated development environment, which is widely used to make robots and electronics. Galileo can be attached to PCs running Windows or Mac OS for electronics creation. Intel offers other computers for the do-it-yourself community. It has announced, but not yet shipped, the Edison embedded computer for wearables, and is shipping the $189 MinnowBoard Max open-source computer for embedded applications.